The craft was designed to be beautiful to look at and simple to make. I have a little ways to go to get to the beautiful part, but I have to say that I am very fond of the look of layer upon layer of African Mahogany plywood strips, and while it takes a long time to build, it is not overly complicated in my opinion. :)The boat is made up of 2 different, but simple shapes; one like the peel of an orange slice, and one which is the cross-section of the boat’s midship. So the frame is really just those two shapes. This allowed me to scale the size and stretch the length to get the shape I wanted as my first vessel. At every stage I think what I have made is beautiful. The day I went from sketches to building was not scary for me even though I knew very little about building a boat. I read a few books and researched materials and sketched and sketched. But at some point if you are going to do it at all, you just have to do it.When I started, I plunged into new processes almost daily, using new tools, and making discoveries that I would have had a hard time planning for without the experience of doing. So I do, and I learn. Every week brings new challenges, which keeps the work fresh and engaging, otherwise it’s just hammering nails for 2 years. No thanks. Is part of your ship made of cardboard? Mr. Stroud, the product you are referring to in the picture above is NOT cardboard but corrugated paper. 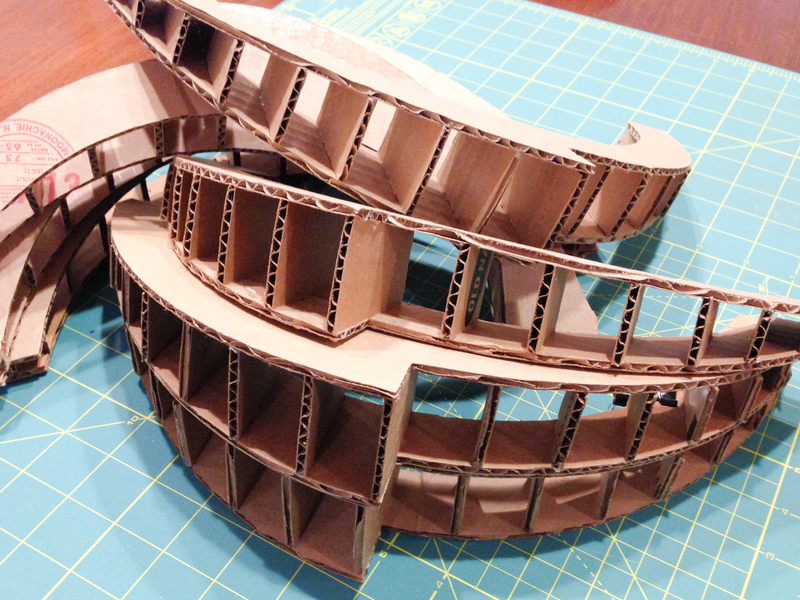 Cardboard is usually just a one-ply product without a fluted center core. All is good , however how does it stay upright? Have I missed this post about ballast! This adventure has me focused one week at a time, so I have not done too much work on planning the keel and ballast until I know the weight of the boat. I just posted something about ballast tonight. Maybe the conversation will start with everyone and I can get something more solid in my head soon. I think it’s wonderful. Can’t wait to see finished boat! I live near the coast in Wa. Right on Port Townsend Bay. Your tsunami ball might be the only way to survive. The Cascadia subduction off the coast is building pressure. It’s said we will have a larger quake than Japan. And a tsunami could be 100ft wall of water. My adult kids aren’t going to leave their business. After all, it may not happen. But evidence I’ve read says it probably will. Soon. That is a super creative, amazingly beautiful and fun folly. I love it and would be happy to volunteer as member for crew of test float. Sounds good. When I get close, maybe I should send out a call for crew. If you have spent any time on a boat, then you will have more experience than me. Maybe we will have to pass around the captain’s hat.